UNITED NATIONS, August 11, updated -- As Aung San Suu Kyi was pronounced guilty in Myanmar and sentenced to at least 18 more months of house arrest, to keep her from involvement in the 2010 elections under a pro-military constitution, the UN in New York didn't even have its normal noon press briefing scheduled. 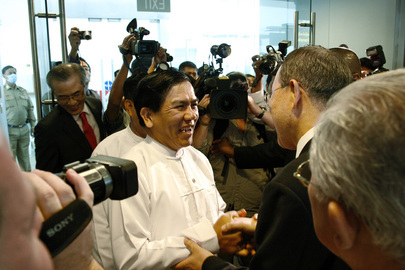 On July 28, Inner City Press asked Ban's Associate Spokesman Farhan Haq, "the trial of Daw Aung San Suu Kyi ended with the Government or the judge rejecting a witness from the Foreign Ministry. The trial is now over and the verdict is expected on Friday. 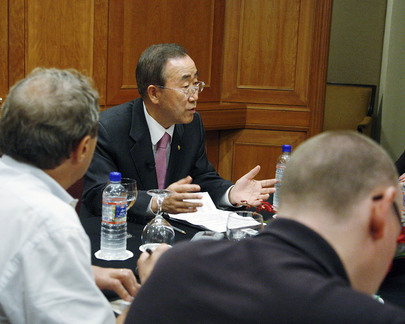 Does the Secretariat or the Secretary-General have anything to say in this regard?" Haq repied, "we may have something further to say once there is a verdict." Well, even past noon on August 11, we're still waiting. The UN Security Council has announced emergency consultations for 3 p.m. on August 11 -- see below. While UN Secretary General Ban Ki-moon recently visited Myanmar with a group of handpicked scribes for a photo op with General Than Shwe and received negative reviews for not even getting a meeting with Suu Kyi, he is now on vacation when her sentence is announced. "my favorite note for the day: I know a number of you are going on holidays next month. For now, we are expecting that, over the month of August, we will provide noon briefings three days out of every week -- namely, on Mondays, Wednesdays and Fridays. On Tuesdays and Thursdays, we don’t expect to brief for now. Of course, if events require otherwise, we might go back to daily briefings. But if things remain calm, I hope you appreciate the slightly more mellow August schedule." Even on the eve of the verdict being announced, the UN sent out at Media Alert that "there will be no noon briefing on Tuesday" August 11. Some surmise that the UN's Ban Administration doesn't want to answer any questions about whatever canned statement it issues, and about the fruit of Ban's stage managed trip. It is not the C-in-C "who must have a military background". You mean the President. However, what the Constitution actually says in the English version - official, but not authoritative - at Article 59 (d) is: "shall be well acquainted with the affairs of the Union such as political, administrative, economic and military." You might feel, as I do, that this automatically excludes all military men from being President because they have, believe me, absolutely no knowledge of economic affairs - just look at their record over the years! Their record on political and administrative affairs is also unimpressive. Suu Kyi is at least the daughter of a general. So the Constitution doesn't only devote "25% of the seats to people with military backgrounds", they are military men. Of the other 75% who are elected, most of these will have military backgrounds as well. So of the 440 - 110 nominated (military) and 330 elected ("civilian") - representatives in the People's Assembly (which combines with the Nationalities Assembly to make the Union Parliament), it would be safe to say that at least 350 are bound to be military and ex-military, just as most of the Central Executive Committee of Suu Kyi's NLD are ex-military (General Aung Shwe, General Tin Oo, Col Maung Lwin, Col Lun Tin and so on and so forth.) One day these 350 will want to change the Constitution - they only need 330 votes. 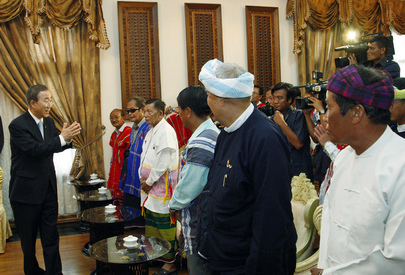 Which brings us back to the main problem in Myanmar, which is that the State is the Military, and the Military is the State and it is not all that easy to separate the two." The August 11 decision on the case of Aung San Suu Kyi makes military dominance of Burma all too clear. And where is the UN? Update: The UN Security Council has announced emergency consultations for 3 p.m. on August 11. Update of 3:25 p.m. -- Western spokespeople outside the Council tell the Press they are pushing for a Presidential Statement, but might have to settle for a press statement or even less (what's now called remarks to the press). China's Deputy Permanent Representative and charge d'Affaires Liu strode into the Council with his political adviser. U.S. Perm Rep Susan Rice stopped and made a statement, but went in as a reporter tried to ask a question. Her office emphasizes: she will speak -- and take questions? -- elsewhere in New York on August 12. Watch this site. Update of 4:16 p.m. -- Council president for August John Sawers emerged to say that some delegations have asked to send the U.S. draft to their capital, therefore there will be no outcome today. France's Deputy Perm Rep La Croix came and said much the same thing, adding that the 18 month sentence appears designed to keep ASSK from participating in the 2010 elections. Inner City Press asked for an update in France's move for additional EU sanctions. La Croix confirmed and said these would not be targeted at civilians. Question: would they let French companies continue to profit from Myanmar?